Guest blog by Arch. Arch is the creator of Floe and co-exhibiting partner of SUSE at SAPPHIRE NOW 2019, May 7-9 in Orlando. If you plan to visit SAPPHIRE NOW, stop by the SUSE booth #2246 and visit the SUSE and Arch teams. Learn more. 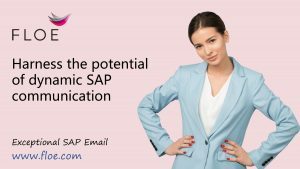 Business emails have changed beyond recognition and the emails you generate from SAP must evolve for you to realise the opportunities now available. Traditionally email has been used to replace posted communication: It was in this sense the delivery mechanism; the container within which the ‘physical’ business document was carried. To this end, the business document was included as an attachment: typically a PDF attachment, so that it could be printed by the receiver. Organisational branding focussed on the PDF output, and often the accompanying email was plain. The SAP output solutions also focussed on the PDF output document. Changes to both the document and the email content have to be managed by IT, and can be complex and slow to deliver. So typically the email content did not change very often and wouldn’t include personalised content, marketing information, latest news, promotions and links. In the new world the email is the document of record. Recipients are able to save as PDF or print if they wish, or just save the email to a file server. There is no longer any need to include a separate PDF attachment. So it follows that the branding focus must now be on the email content rather than a separate output document: the email becomes the SAP output in its entirety. The challenge is now to provide the development tool to push SAP data into the email, and provide a design tool to enable email templates to be maintained quickly and easily. This is exactly what Floe does. Now we are able to include links, marketing content and personalised content dynamically, and change it quickly without the need for IT involvement. So whereas the email used to simply be the postman, now it’s the letter too: This is the new business reality. If you are still using email just as a delivery mechanism then there are many opportunities you are failing to enjoy! Your customers and employees require and deserve a first-rate experience, with rich graphical content and the information presented in a way that’s easy to read and understand. This can involve personalisation where content is included or excluded dynamically for each particular recipient. Every touchpoint with your business communities provides the opportunity to inform them about your organisation, your market, your products, your performance, job opportunities etc. Each time you communicate with your customers you have the opportunity to offer more. Provide links to resources to make things easier for them; provide a ‘gold standard’ that will keep them coming back. Every communication point with your business communities provides the chance to reinforce your brand through consistent use of logos, fonts, colours and other styles. As social media provides such an important part of your marketing communication, every email you send can be used to share content and links to help build your fan club. The vast majority of marketing emails are simply not opened or read. But business communication like order confirmations, shipment updates and payment receipts are read every time: This makes them enormously powerful mechanisms for reaching customers to offer sales promotions. If you’re trying to change the world; if you’re trying to disrupt a market, then you need your contacts to see the world as you do. Every communication inside or outside your organisation provides a unique opportunity for you to own the conversation and push your key messages. You might spend a huge budget on marketing campaigns to drive website traffic. But by including content and links you want to share on every business communication you can run a permanent traffic generation campaign for free. Every SAP business document can be a newsletter too. Floe enables you to easily build and maintain exceptional emails in SAP. You can replace every workflow notification email, facing internally or externally. And you can replace legacy output technologies – SAPScript, Smartforms and Adobe forms with pure email content, which looks fantastic on any device. Find out more at www.floe.com today.